Russia and China abstained on Thursday in a United Nations vote to extend a peacekeeping mission in Central African Republic (CAR) because the French-drafted resolution did not make direct reference to Russia’s efforts to help the country. The remaining 13 U.N. Security Council members voted for the annual renewal of the operation, deployed in 2014, which has more than 12,000 troops and police. Violence broke out in CAR in 2013 when mainly Muslim Seleka rebels ousted the president, prompting reprisals from mostly Christian militias. Despite their abstentions, Russia and China both said they supported the peacekeeping mission. But the Security Council vote highlights a wariness by Western powers of efforts by Moscow and Beijing to expand their influence in Africa. “Assisting the government of the Central African Republic is not a competition. In helping one of the world’s poorest countries emerge from more than a decade of conflict in pursuit of peace and development, there’s no room for jealousy,” Deputy U.S. Ambassador Jonathan Cohen told the council. Earlier on Thursday the Trump administration unveiled its strategy for Africa, which national security adviser John Bolton said aimed to counter economic and political influence of China and Russia on the continent. In CAR this year Russia has sent plane loads of weapons and dozens of contractors to train soldiers and secure mining projects, marking the start of its highest-profile military foray in sub-Saharan Africa for decades. While the African Union, supported by CAR’s former colonial ruler France, is trying to broker peace, Russia and Sudan separately mediated a preliminary agreement signed by Central African armed groups in August in Khartoum. 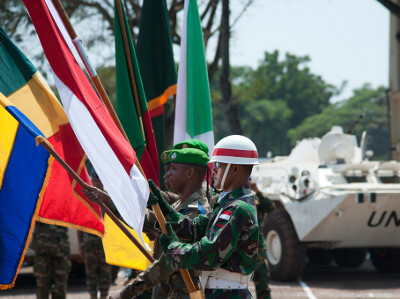 The African Union initiative “is the only dialogue process which is direct and inclusive between the Central African government and the armed groups from which dialogue and comprehensive peace agreement could emerge,” French U.N. Ambassador Francois Delattre told the council on Thursday. Russian U.N. Ambassador Vassily Nebenzia complained that the French-drafted resolution did not welcome peace efforts that “are in line with and help the implementation of the African peace initiative” or the contribution of the Russian trainers. “Behind all of this what we can see is an approach to the African countries as one’s own turf and reserve within the vicious circle of metropolis versus colony,” Nebenzia said. Chinese U.N. Ambassador Ma Zhaoxu also said the resolution should have recognized all efforts to broker peace in CAR.